Some recent reviews... Thank you everyone for taking the time to comment! Shopping from the US, Bookster his a lively, distinguished line of tattersall shirts from other UK offerings. The color patterns are more lively (which opens up pairing options from more conservative country shades), the fit is very good, and the material is quite comfortable. The pair I have are becoming favorites in my wardrobe. Excellent on all accounts. I find it a little below the mark, though when it comes to breathability. Apart from that a superb piece of the British textile industry. I'm delighted with my new hacking jacket. Comfortable, well cut and stylish. Good fit and quality, arrived in time for Christmas. Would buy again. I own two or three other waistcoats, which are all just fine, but this little ditty has everything I’m looking for in the garment: PERFECT cut, beautiful craftsmanship, and the tweed is an absolutely gorgeous MacDonald of the Isles tartan, which will be perfect for the upcoming Christmas Season and New Year’s Eve celebrations. Perfect down to the last stitch. Thank you, Bookster! Perfectly executed and delivered promptly. Executed exactly as envisaged. Nice fit and extremely professional tailoring. The keeper's tweed is very impressive, nice and heavy for outdoor use. The tailoring is impeccable. I very much look forward to wearing this jacket outside during the winter. I had some doubts that the jacket would be as expected. Michele spent a lot of time getting the right measurements and had a lot of patience. When I got the jacket I was surprised about quality and fit. Simply perfect! The fine folk at Bookster made me a (scally/flat) cap in this lovely, bold Harris Tweed cloth, and I couldn’t be more pleased with it. It’s a handsome, robust wool cloth which matches well with many of my garments. I’ve never seem another scally cap in this tweed, and hope to soon order a jacket in this same tweed. A real head-turner! I have purchased a number o items from Bookster and have never been disappointed. I recently purchased a waistcoat and a pair of moleskins and I am delighted with both. I love tweed and Bookster has a great selection with fantastic colors and patterns. The Gelly is less stark than pictured above with a stiffer hand feel than another tweed - Harris hounds tooth - that I have. I bought a Made to Order 3 button, soft shoulder jacket and I love it. The whole process was very smooth and the workmanship is fantastic. I will definitely be ordering more products from Bookster. Beautiful fit and a lovely cloth. From ordering to delivery Booksters has accompanied the process with utmost care. The staff is extremely helpful and the received Hacking Jacket is perfect in manufacture and fit. From ordering to delivery Booksters has accompanied the process with utmost care. The staff is extremely helpful and the received waistcoat is perfect in manufacture and fit. Good cloth, which appears subdued in artificial light, but marvellous in full daylight. Conservative cut and good fit. High quality product, great design and fabric. This jacket is an addition to others in my closet. As always, the jacket is well tailored and just as ordered, It fits very well. The tweed is as shown in the cloth gallery. Ordered a ready to wear hacking jacket and this was shipped on the same day and arrived the following day. Really lovely jacket, good quality and well made. A made to order jacket definitely on the cards in the New Year. My first two suits from Bookster, which I was fitted for in 2012, have been a delight to wear and have been used regularly for both the sporting field and smart casual wear. My son has always wanted a Bookster suit for himself, and this year I decided to make a gift to him. Not having time to visit for a fitting on this occasion, we were given a set of measurements to check and we sent the photos requested. He is not an easy fit, however we were delighted with the finished garments which fit him very well indeed. I also treated myself to another suit for business wear and the quality is just as good, if not better, than old Bookster and the fit is perfect. On top of this our request for a timely delivery to wear the suits on a planned business trip was met. I really appreciated the helpful attention to detail from the friendly and knowledgeable staff and would not hesitate to recommend Bookster. the quality of these new jackets is even better. I really love your personal service, walking those of us through the process that are not used to the British "bespoke" system. The quality of Bookster clothing is unsurpassed, and I appreciate the large selection of tweeds you offer. My husband has been wearing tailored waistcoats "vests" in lieu of sportcoats for over 30 years now. I'm afraid I imposed this style on him -- it stuck -- and early on it was so difficult to find such quality and variety in America. It still is. The vests are now his trademark. He works with the public in a combination education/enforcement role, and he is known for his lovely vests. Oddly enough, they are now becoming popular in America, and are in all the catalogs this year. Not Bookster quality! The individual input you offer to the customer to express one's individual style is really really wonderful. I got the Jacket and I'm very happy and jump for joy.The Torridon clothing is lordly and sporting together. The tailoring excellent. I received my jacket/order safely today. And yes it does look, fit, work and wear to perfection. Thanks for a superb piece of tailoring - bit worried about sizing over the internet. Needn't have worried, the fit is excellent, Bardowie is a simply stunning autumnal tweed. The depth of colours - thousands! Photos don't do it justice. Absolutely no disappointment whatsoever - just stunned. Must be important for customers to get samples/swatches - I will for next order! Just to let you know I've received the suit, and it's fantastic! It's fits perfectly, and the colour / pattern looks so much better than I hoped - it's sometimes hard to visual what a small swatch will look like large, but I'm chuffed to bits! Having previously only purchased an electrical lead that cost 0.15p from Amazon, I approached the prospect of buying a three piece suit on-line with some trepidation. Others have already commented on the support that Bookster provides to those treading rather carefully on new ground and I can readily agree with those people; Michele was very patient in finding out exactly what I wanted and talking me through the process. But what I really want to comment on is the outstanding after-sales service that I received. One might reasonably fear that once a suit was paid for and dispatched a company would be reluctant to have much more to do with the client; this is where I was most pleasantly surprised with Bookster. On trying on the suit for the first time, I felt that it needed some slight alteration; which were readily accepted that I wanted the alteration, she then liaised with the tailor to make sure that it was carried out expertly (although small, the change was technically difficult) leaving me absolutely satisfied. So, I would recommend Bookster not because of the quality of the cloth or the expert tailoring or the support offered when submitting your order; as much as all this is true, I would recommend Bookster because of the way you are treated once the suit has been delivered. I have never bought clothes on the internet before or even mail order so buying a suit on line was a big step for me. Booksters could not have made it easier. I could have a chat with them before I ordered to sort out any queries and emailed any other enquiries I had. They sent a sample jacket for me to try so that I could be certain of a good fit. They kept me informed throughout the process and advised me of the delivery date in good time so that was easy to arrange too. But why am I telling you about this boring admin side? That is so unimportant when you see my new tweed suit, it is fabulous. I am absolutely delighted with it. Even if the service had been poor I would have ended up with a great suit, the fact it wasn't made the whole experience a pleasure. Just thought I'd let you know I received my jacket on Monday and I am delighted with it. It fits perfectly. I will definitely recommend you to everyone, especially for the wonderful service. Can't wait for the next show now! I received the jacket this monday. Just to make it short: Perfect! Due to your support it first perfectly, sleeves, shoulders, chest, waist and back and all details (cloth, linen, buttons, vents e.g.) is bespoke tailoring at its best! Thank you very much. I cannot wait to choose my next jacket. I just wanted to thank you for a fabulous tweed jacket. It fits like a glove and is even better in quality and cut than I had hoped for. In this day and age customers rarely take the trouble to thank suppliers being all too ready to complain. The jacket and service that went with it was faultless. Thank you so much for the suit: I am absolutely delighted with it; beautiful cloth, excellent fit, and first class tailoring. A HUGE improvement on the other made to measure internet tailoring services I have used - largely due to the quality of the workmanship. I wish you all the best, and will definitely order from you again. I am writing to say how pleased I am with my jacket in Johnstons’ Lomond Cheviot Tweed. Having received it two weeks ago, I have worn it on a number of occasions and I am absolutely delighted. I had been searching for over two years for source which accommodated my size and you have more than exceeded my expectations. The quality is superb, the price very reasonable and your conscientious and courteous service a real tonic. Your web site is very professional and contains an excellent selection of cloths. The photographs showing different views of each jacket give a clear idea of the pattern and style and the information relating to size and ordering is most helpful. In addition there is the telephone, when you have been ready to offer advice and guidance. It has been a real pleasure to deal with you and I trust that your business goes from strength to strength. Should the opportunity arise, I shall not hesitate to recommend Bookster. Just to inform you that I received my Hacking Jacket and I am utterly Delighted!!! It is precisely what I envisaged. The quality and fit is grand and the jacket is very structured, which is precisely what I requested. I shall request you to please keep my measurements (the fit was brilliant) on file, as I shall certainly be ordering many more jackets in the near future (currently saving for upcoming wedding). I am pleased to find a source that sells garments made in England, made from good scotch quality tweed, with very nice customer service. I have to admit that I was a bit reluctant to have a go at bespoke items from the internet. How I found Bookster is quite an enigma in itself, but the results have been an extraordinary find. I have the luxury of the option of custom jackets and suitings from a very fine haberdasher in Atlanta, GA who continues to provide exemplary service and quality. 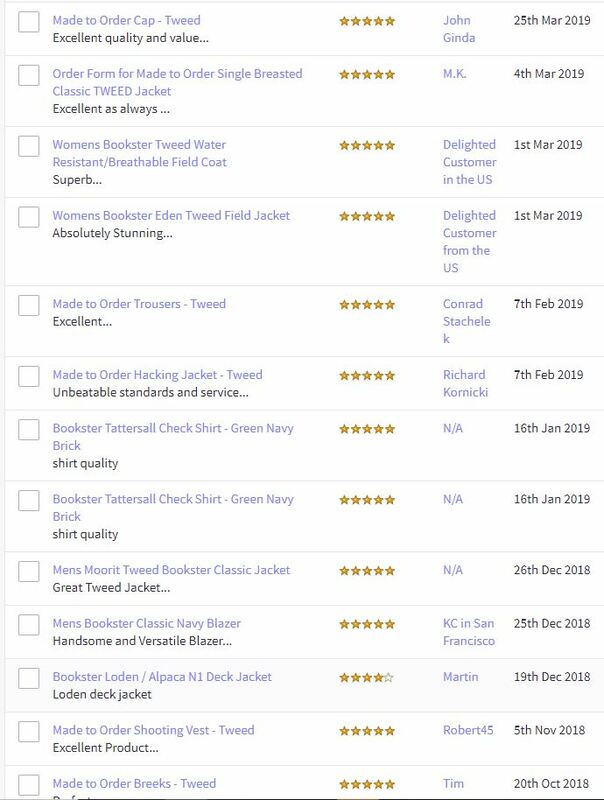 But…, since my discovery to Bookster UK, my desire for fine clothing has been transformed not only because of the excellent quality and selection but also of how they are able to “nail” the fit. There is no better way to measure than in person than with a tape measure, chalk and one on one feedback as we can all agree, but it just seems Bookster has a sense of the customer. Like the fabric is poured on. And I am several thousand miles away. Your turn around time is comparable, but without the second fitting! I am now a repeat customer of some 4 different pieces over the last 8 months. Two-3 piece suits and two jackets. I am awaiting with anticipation of my sixth item – another suit for Spring. My new tweed hacking jacket arrived yesterday morning, just wanted to say thank you very much. I am thrilled with the quality and it is an excellent fit. I now cannot wait to take the horse out somewhere so I can wear my new jacket! Well worth waiting for and good value for money. The service you offer and bespoke options is much appreciated as it's so hard to find without spending a kings ransom! The 5 piece suit arrived today. It is staggeringly beautiful...just stunning. It is exactly what I was looking for...it is...for lack of a better word...perfect! Please send my compliments to all of the people who had a hand in making this suit. A special thanks to you. I would have been lost without your assistance. You have my promise that all of my suit needs will go to Bookster. I am sure that my hickory golfing friends will ask about your craftsmanship during the National Hickory Championship. You have my promise that I will send them your way. I received the suit on Saturday morning and I'm very pleased with it - a perfect fit and well made. Thanks for a great service -please pass on my thanks to the tailor. I was a proud owner of (3) Bladen hacking jackets but now I'm more proud to have a real Bookster! Me and the dog are very happy with it. Measurements all fine. I'm afraid we meet again. It took some time but now I have really something. The tweed suit arrived today... I'M TOTALLY SATISFIED !!! Please pass my congratulation on to your tailor who did a perfect job. I already want to order another pair of trousers. pleased with the lining material and your pricing beats every single 'shop' jacket I've had the misfortune to see. Thank you so much! I'll certainly be ordering more from you in future. The jacket has arrived and it's perfect. As usual, I am completely satisfied with both the tailoring and material. Thank you very much for the best customer service I have experienced. I ordered a shooting jacket from Bookster. The care for details like the buttons and the general feel of very good quality makes it my favourite jacket for the colder seasons. I like to think that this jacket could probably outlast me and wearing a shooting jacket in Switzerland makes you really stand out. Just received my jacket. It is awesome and fits well. I will order another soon. The jacket you tailored for me got here a day or two ago. I’m very happy with it! The Hunter tweed was a perfect choice and the lining complements the tweed very nicely. Thank you so much for all your kind help and patience. I’ll be glad to recommend you and I also look forward to placing another order with you sometime in the future. The coat has arrived, and looks stunning. The tailoring is impeccable. Size seems to be perfect. I am also grateful for delivery in only 2 days. The jacket arrived and I am more than pleased. It's spectacular. Looks like I will need a few more! What can I say! Superb! Size of trouser, waistcoat and jacket is perfect! The waistcoat back in Tattersll cotton is very special, indeed! But, after a few minutes wearing this stylish thing, I think I will love it. Conclusion: Happy customer will come back to you again! I have just received my glen tweed hacking jacket. Just had to write to you & compliment you on such a fine product, the pictures of the tweeds on the website just don’t do the material justice, the tailoring and fit are also exceptional. I would have no hesitation in placing further orders with you. I've had clothes made since the age of seventeen. Now, somewhere between fifty and death, my closet is loaded with excellent kit from France, Britain and North America. But bespoke and made-to-measure clothing has grown nauseatingly expensive, and often requires multiple fittings which bring further expense--and inconvenience. Bookster is different: the firm works to adapt elegant models to the particular requirements of its customers, and does a swell job making new friends. I love tweed, but I love good service and kind hearts better still. Peter and Michele are decent to a fault, knowledgeable, understanding, and highly flexible in their approach to client idiosyncrasy. I need tasteful clothes that suffer without complaining (constant travel; rough weather; the occasional misunderstanding). Bookster allows a gentleman--or a lady--to dress superbly in highly individualized style. This firm is proud of its equestrian roots, which yield sturdy garments made for action. Finally, you may depend on thoughtful advice, should you require help choosing from an excellent selection of the best tweed cloths available in Great Britain. Bookster is a modern company that behaves like an old-fashioned outfitter--customer service is an absolute priority for Bookster. Just a note to say that I got the Jacket through. I just wanted to thank you for your help with my order and that I am very pleased indeed with the result. I also wondered if you have kept the sizes as i will be ordering another jacket shortly. Many thanks again for your help with this order. I would like to thank you for the jacket which has just arrived. It really exceeds my expectation and for that I have to say that "you have today made a man happy"
Wearing clothes has always been a great passion for me and when a garment feels that good it makes me smile and that alone is worth the wait. Doubtless to say I am looking into what to order next from yourselves. !! Have a nice week end. I am so looking forward to going out tomorrow to show off my "new addition". I would just like to thank you for the very best service and the jacket is perfect both regarding size, quality and that we received it in time for Christmas. It was a very happy young man on the Christmas morning. The jacket arrived today, and I'm most pleased; the fit is perfect and the weight is just right for this climate and a fine job has been done by the tailors. I would like to thank you especially for the professional and polite service you have offered! Apologies for not writing this email sooner. I have received the suit and am extremely proud to own it. I would like to thank you for your excellent customer service throughout, going the extra mile in finding me the perfect material and your knowledgeable advice regarding sizing. I had countless comments on the suit throughout the day and was pleased to pass on your details; there were many people who know their suits at the wedding and commented that they could see that mine was something special. I am attaching some action shots of the suit for your archives. Once again my most heartfelt thanks. I just wanted to say how absolutely delighted I am with my hacking jacket. Stylish, excellent quality and beautifully tailored. No more expensive hand tailored jackets and suits for me - you are the business! I wanted to write and let you know that I received my jacket and am absolutely thrilled with it! Not only does it fit perfectly, I wanted to thank you for the first class after sales service that you and Michele provided me with. I look forward to my next purchase and will be strongly recommending your services to others. I have just received my order as above a waistcoat in Buie. What can I say but a very very big thank you. It is absolutely everything I was hoping it would be. It fits like a glove and is perfect in every way. Exquisitely made and all my specifications met have made me very happy and I must say that I look rather dashing in it!!! Well I would say that wouldn't I !?! Thank you once again, and for pushing the order through before the weekend it has been much appreciated There is however one problem - I am going to have to buy more, as I haven't found quality of this standard and price anywhere. Just wish I had found your company sooner! I apologise for not writing sooner and should like to take this opportunity to thank you for sending the suit. It is fantastic - cut perfectly, not a stitch out of place, superb cloth and wonderfully made. The service was excellent and you were very helpful. The quality and level of personalisation available makes Bookster suits easily comparable with any bespoke offering but at a fraction of the price and with a lot less fuss. I am absolutely delighted and, in spite of an urge to keep it as my little secret, I shall be recommending you to all of my friends. I think this is but the first of many purchases from Bookster. I just wanted commend you on the Bookster suit I received last week. recommendation to anyone I meet. May I wish you every success for the future. The suit has now arrived and I am absolutely delighted with it. The fit is perfect and it is beautifully cut. I have to admit that I was slightly nervous about organising a made-to-measure suit by remote control, but I could not be more pleased with the results. Please keep my details on your records for when I next need a new suit. I received my order Grannoch tweed hacking jacket and can't be more satisfied. Quality construction with bespoke options not available on this side of the pond. I get compliments on the jacket frequently. So much so I have recently placed another order. Just to let you know that my suit arrived safely last Friday. I am absolutely delighted with it. The workmanship and attention to detail is superb. It fits like a glove and I’m really looking forward to wearing it on the big day itself. I’d like to thank you on your excellent service throughout the whole process and please pass on my thanks to anyone else involved. We have received the suit and it is exactly what we wanted. Thank you very much! We will send you a picture from our wedding day! I have shopped for fine classic clothing around the world and discovered a treasure nestled in Herefordshire. Starting with the purchase of some vintage Harris Tweeds and then the new Bookster range, I cannot adequately express my pleasure with the garments and service level - all prices that are considerably below what one would find in shops not offering near the quality for the money. Try Bookster once and you WILL become a convert.